Jam tarts are a quintessential British teatime treat. 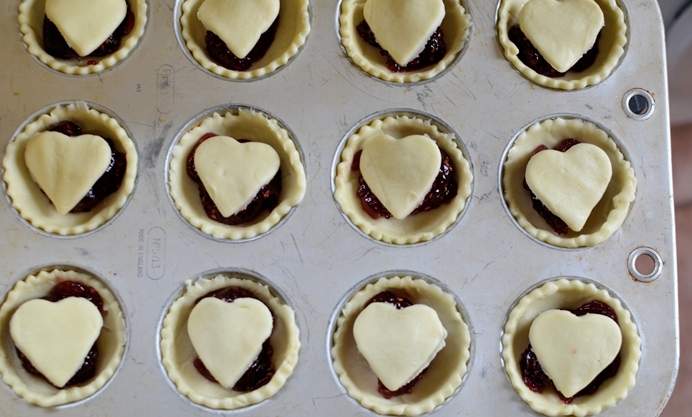 Why not try making them with a pastry top as a simple yet heart-felt treat for Valentine's Day. 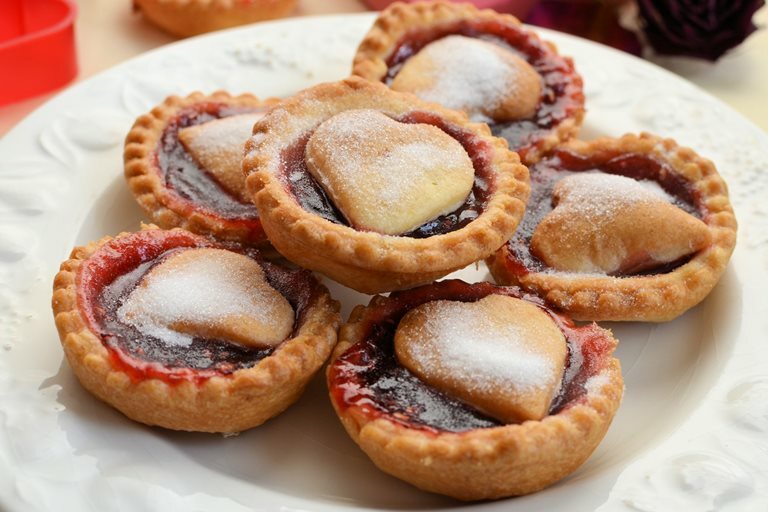 Jam tarts are a quintessential British teatime treat - little crispy short crust pastry rounds filled with assorted fruit jams, such as strawberry, raspberry, apricot, blackcurrant and lemon curd. They were the first things my mum taught me to bake when I was little, and in turn, I taught my daughter how to make them when she was very small. 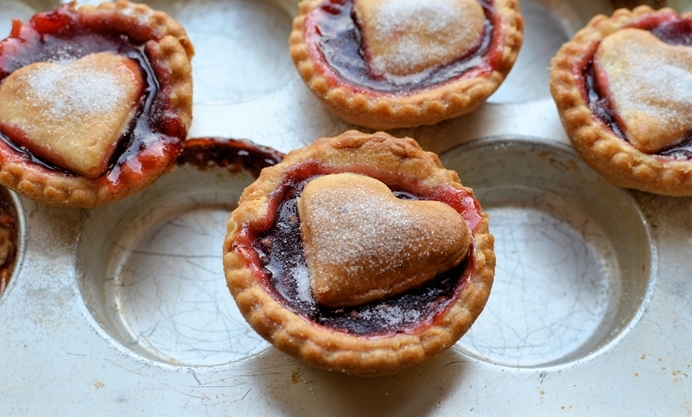 Here I have suggested that as a Valentine's Day treat, you top the jam tarts with a little pastry heart........after all, the way to a loved one's heart is through their stomach, and they can be popped into the office lunchbox as a romantic sweet treat. Jam tarts also have a bit of an interesting history, with woman vying for prizes in annual jam tart baking competitions; it was traditional for ladies to make a large jam tart with different colour and flavoured jams separated by fluted and criss-cross pastry lattice work for Church baking competitions. These large jam tarts could be quite complex with more experienced bakers creating astonishing and highly decorative latticework with up to 8 or 9 different jams! These “Jam Tart Contests” were the original Great British Bake Off competitions and were fiercely fought every year, with a housewife's reputation being made or broken depending on her prowess with pastry and jam! Jam Tarts normally don’t have any pastry topping however and for the rest of the year I just make them with no pastry lid, or use other suitable shapes appropriate for other special events such as stars for Christmas etc. I have suggested homemade short crust pastry in the ingredients, as it is so easy to make and is far superior to ready-made, although I DO use ready-made when I am short of time. Try to use good quality or homemade jams and jellies, the higher the fruit content, the less the jam or jelly will bubble out of the pastry case. These are essential for any English Tea Party, especially if Alice in Wonderland has been invited............along with the white rabbit! Have fun!